Appleseed claims that the popular M&P 15-22 rimfire rifles after at least four serious malfunctions at Appleseed shooting events. Smith & Wesson is issuing a safety warning on all M&P15-22 products made before February 1, 2019. These M&P15-22 rifles and pistols may be unsafe to use. 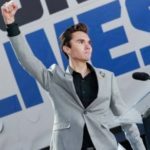 David Hogg delivered an ultimatum to Smith & Wesson over the weekend, either the company funds gun control research or it will be destroyed. An ideal home defense Ar-15 should be lightweight, modular, decently accurate and equipped with a light, laser, and a red dot sight. Smith and Wesson’s new M&P15T with M-LOK and Crimson Trace LiNQ System, perfectly fits these requirements, and I recently had the pleasure of testing one. SMITH AND WESSON M&P15-22 SPORT MUDDY GIRL 10212 25+1 "NO CREDIT CARD FEE"